Ideally, you will need 4 days to make the most of your time here. The town is small and easily walkable. There are tour agencies and empanada shops (the best kind). More time will allow you some relaxation and wiggle room, less means you will need to select your activities wisely. 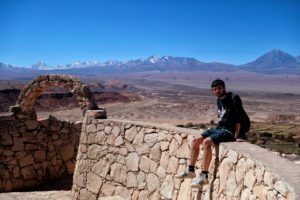 Without further ado, here are the best things to see and do around San Pedro de Atacama. 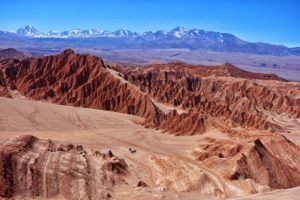 Valle de la Luna, or Valley of the Moon, is a spectacular valley located just 13km from San Pedro. 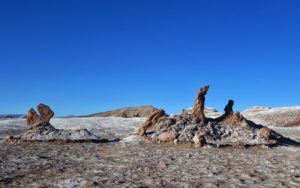 The information desk at the entrance provides maps of the valley, taking you all the way to Las Tres Marias, three unusual rocky formations that jut out of the desert floor. The first stop, around 3km from the entrance, is the salt caverns. 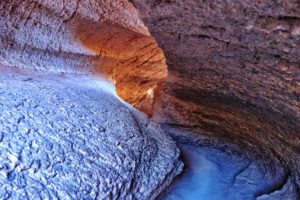 They’re a winding and narrow cave system, containing unearthly geological structures. You can walk the snaking trail in around 20 minutes and either carry on along the main road, or take a right as you exit the caves and explore a less visited part of the valley. There are more surreal cliffs and caves, but the further you head in this direction, the less people you will encounter, and the more it begins to feel like you are truly isolated in the desert. The midday sun beats down on your face and neck, no matter which way you look. 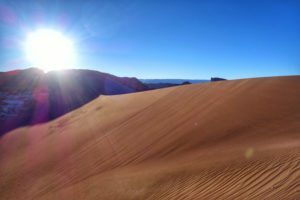 The main view that everybody comes to see in the Valley of the Moon is the sunset, particularly from the top of the giant sand dune. The path is sandy but well worn; it shouldn’t pose a problem to anybody. The view from the top makes you understand the logic behind the valley’s name. It was also here where NASA tested the prototype for the Mars rover, due to its strikingly similar terrain. Watching the sun drop behind the ridge is beautiful on its own, but it doesn’t compete with the red-gold afterglow that engulfs the desert. At the top of the dune, you can walk along the ridge in either direction. 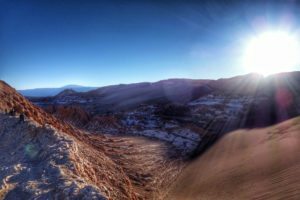 The right allows you a view of the sun setting behind the sand dune, and if you turn around, you have the full chain of the Andes mountains, complete with several large volcanoes in the distance. The left has a view of the craggy hills and the interminable desert. The path goes on further, too, meaning there is more space to find your own spot, away from the crowds. This is the busiest time on the sand dune, but the view is remarkable all-day long. A sunset here is one you will remember for the rest of your life. 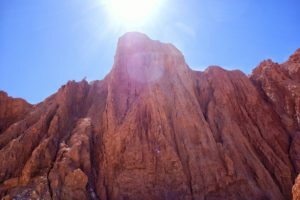 Getting to Valle de la Luna can be done in a several ways, depending on your preferences. The best option is to take a tour, which will pick you up from your hotel or hostel and transport you to the entrance, visiting each of the locations with a knowledgeable guide, before dropping you back off at your accommodation. They usually start at 2 or 3 pm so that you can catch the sunset, but an earlier one is possible. Cycling is easy as well. In your free time you can rent a bike in town and start your trip. The ride from the centre of town to the entrance takes about 25 minutes. However, upon entry into the actual valley, the road becomes rickety and there are steep sections, too. A helmet and visibility jacket are essential for you to take the bike into the valley. I made the mistake of cycling there without either, and was told upon arrival that they would not let me take the bike inside without them. The Valley of the dead, also known as the Valley of Mars, is closer to San Pedro than the Valley of the Moon. Its surreal landscapes are just as astonishing, but they have the bonus of being less crowded than their bigger and more popular neighbour. That’s not to say that nobody visits the Valley of the Dead, but it doesn’t get as many as the Valley of the Moon. The entrance is on the right-hand side of the road to Calama, approx 2km from the centre of town. This valley is the perfect place to sandboard. The Valley of the Moon also has a huge sand dune but you are not allowed to sandboard on it. As well as climbing the dune to ride back down, it is also worth going up for the view alone. 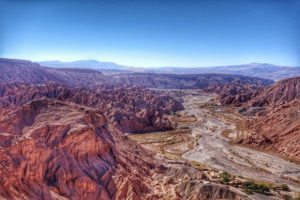 The desert rolls out before your eyes, stretching all the way to the jagged Andes mountains, cowboys ride through the rugged valleys, kicking up dust in their wake, and bizarre outcrops defy logic at every turn. I made the mistake of climbing the dune in a straight line, from the base to the highest point. Don’t make the same mistake as me. I had to use both my hands and my feet, as the surface was almost vertical. My feet sunk into the sand a good 30cm with each step, making the whole ordeal unnecessarily demanding. I had half the desert in my shoes by the time I made it to the top. Luckily, I had enough water to make sure I didn’t pass out from the midday heat. Despite taking the most difficult route (there is a well-trodden track for sandboarders, which takes you up diagonally), it was well worth the effort. You can also continue on the path further into the valley, which winds its way up to the opposite side of the sand dune, giving you a view of what lies beyond the towering ridge. It looks like an extreme Motocross track, built for giants. I still struggle to get my head around how these valleys were formed. You can travel here using the same methods stated for the Valley of the Moon. A way to get to the Valley of the Dead is with a tour departing from your hotel. Your van will stick to the main road towards Calama. The sandy hill, directly in front of you as you leave the town, is the entrance. It should not take longer than a few minutes to get there. If you have enough time it is possible to reach very good viewpoints. Take plenty of water and some snacks. There are tours combined with the Valley of the Moon, if you prefer to visit both at once. Finally, you can cycle. It’s easy to get here, despite a little up-hill section. Cycling in the actual valley can be quite difficult however, as the sand can be thick. I walked to the top with my bike, then rode down (without peddling), but my wheels jammed in the sand and I flew over my handle bars, almost rolling off the steep road and into the Valley of the Dead below. It would have been a fitting place to die, but it was not to be. You can also cycle from here to Pukara de Quitor in a relatively fast time, as there is a path directly from entrance to entrance. This fascinating hill-side ruin was once a mighty fortress, perched in a great defensive location, destroying the element of surprise for invaders. You can find it 3km north-west of San Pedro. Like most of the attractions here, there is an entrance fee of a few thousand Pesos. If you have a bike, there is a place to lock it at the entrance. You can choose between climbing the ridge that runs along the 700-year-old ruins, or the hills in the distance. The hills contain several view points and shelters to rest, as well as a few interesting structures at the top. From the peak, you can look down on the Valley of the Dead to see it from a different perspective. You can also gaze into the valley that leads to Catarpe – an interesting and adventurous bike ride away. The view from the top of the hills is worth seeing. You see everything from an inferior angle, and whilst you can get a lot closer to the ruins, you can’t go inside them. Having said that, the path is short and is probably worth the 15 minutes it will take to walk. Near to the entrance of Pukara de Quitor, is another path. Instead of taking the ramp up to the bike storage and ticket office, go the opposite way, sticking to the wall of the rock, and follow the path up to a cave and some amazing archaeological carvings. The cave is pitch black at certain points, so make sure you have a torch handy. Be careful with your head, too, especially for tall people like me. You’ll be bending a lot. On the other side of the cave is a small open area, where you can witness the unusual rock formations up close, and add your own cairn to the masses already there, before heading back the way you came. It might be a good idea to take something to cover your nose and mouth, as you will inhale a lot of dust. Outside, you can marvel at the two giant heads, that have been carved from the cliff face. All the above options apply for here. You can take a tour, walk or cycle. Arguably the best activity to do here, based on the area’s pristine skies, is look upwards. Within the next year, over 70% of the world’s astronomical observatories will be based here. 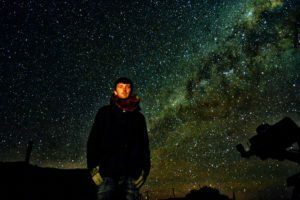 From this desert, you can see the Large Magellanic Cloud with the naked eye, a foreign galaxy that orbits the Milky Way, over 150,000 light years away. You can also see the Small Magellanic Cloud, fainter and even further away. It’s the farthest visible object in the southern hemisphere, without the aid of telescopes. You can also stare into the heart of our own galaxy. Do you know that strip of cloud-like substance you see in films and the best astrophotography? You can see it with your own eyes. It takes a brilliant camera to be able to pick any of it up, but luckily for us, almost all astronomy tours will take a group photo on their own cameras. You can ask for one on your own, too. I went on a tour and couldn’t recommend it enough. They took me on a 2-hour tour, pointing out all the visible constellations of the zodiac and explaining the reasons behind them. They also showed us a short documentary and allowed us to feast on little sausages and snacks. It obviously helps if you have an experienced guide who can point to Saturn as soon as you ask him and tells you everything about all the stars you see. I visited in August, the tail-end of their winter, and Saturn was the easiest to see. Early at night, it is possible to spot Mars and Jupiter, too. At different times throughout the year, it’s possible to see all the first six planets with the naked eye. The high-altitude lakes are definitely worth checking out if you’re in the area. 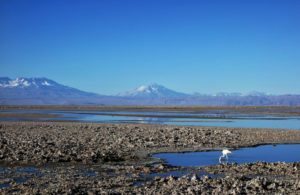 You have the opportunity to watch pink Flamingos in Chaxa National Reserve, walk on a frozen lake at Red Stone, and see Vicuñas (a relative of llamas and alpacas) in their natural habitat – the hills above 3,000m. It’s best to start early for these places, as they’re a bit further away than the majority of the attractions. I drifted in and out of sleep on the ride there, catching dreamlike glimpses of snowy peaks, sprawling desert and grazing vicuñas, half-listening to the guide talk about how vicuñas are still hunted for their fur, despite it being illegal. I woke up when the smooth road swiftly changed to a jolting sandy track. I bounced up and down, bashing flailing limbs off parts of the jeep that I didn’t even know existed. Then I was hit by the cold. Mornings at high altitude aren’t pleasant for the half-dressed. Luckily, I was prepared. The best way to go to these places is by taking a tour. It’s worth it. We visited all the aforementioned places, as well as Toconao, a traditional village. The main square has large cacti that grow 1cm per year. These cacti were over 2 metres tall, meaning they were planted in the early 1800s! You can explore the handcraft shops and go souvenir hunting, check out the old church, or taste local homemade ice cream. They have Rica Rica flavour, which is a mint-like herb that grows in the shrubby area of the desert. The driver makes a short stop here, too, for you to harvest your own supply. 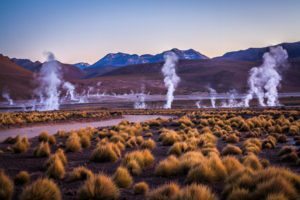 Tatio Geysers – Expect an early start if you visit these. They’re most active around 4.30 am. 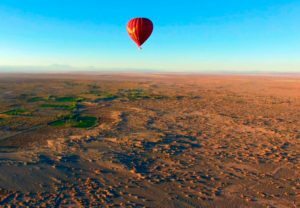 Hot Air Balloon over the Atacama – Ballooning over the Atacama Desert is a breathtaking and unique experience. You will start the tour right before sunrise to see all the colors and rocks of the desert in the morning light. 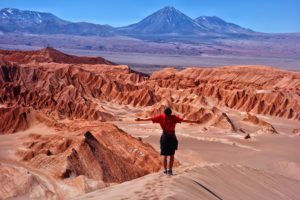 Every tour is different because you don’t know where the wind will take you but you can be sure that you will have an impressive view over the stunning landscape of the Atacama Desert. This is definitely a memory you will never forget! 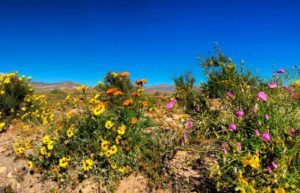 The Flowering Desert – A lot further south from San Pedro, but still in the Atacama, near to La Serena, there is a natural phenomenon taking place in the desert, causing flowers to blossom everywhere. It only happens once per year and this year is supposed to be the largest ever. Generally, San Pedro is slightly more expensive than other towns of similar size in Chile. The customers are predominantly tourists, which means the prices are inflated. It’s possible to find all type of vegetables, meat, fish and local food. 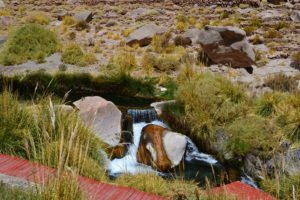 There are many options of restaurants, accommodation and activities for your stay in San Pedro de Atacama. 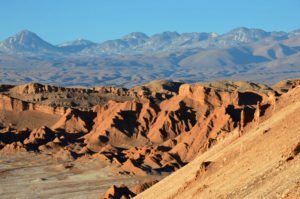 The Atacama is dry, with clear skies all year round. You can count the number of clouds you see in your time here on one hand – most likely, you won’t need any hands. On the astronomy tour, the guide said that only 30 nights of the year are cloudy, and even then, they’re not terribly intrusive. Chilean summer runs from December to February, and their winter, from June to August. However, the climate here doesn’t change that much. 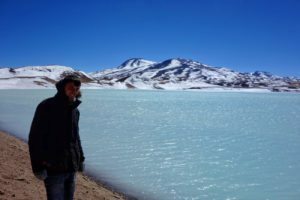 Due to the altitude (2,408 metres above sea level), San Pedro experiences cold nights all year round, with the lowest being in July and August, at -1° C, and the highest, around 5-6° C, in January. In the day, the winters can reach 20° C, and the summer, 25° C. The altitude makes the days seem hotter though, because the sun’s rays have less of an atmosphere to cut through before reaching you. Combine this with the unusual clarity of the sky, and basically, you will frazzle. If you want to avoid the crowds, then the best time to visit is just before winter (northern summer holidays), but after southern summer. April – June is classed as low season here. There will be less people, but never expect it to be empty. San Pedro is a tourist hot spot. 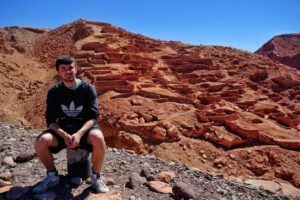 Altitude Sickness Tablets – Depending on your attitude toward altitude, you may wish to bring some medicine. Some people simply don’t agree with being at higher elevations. While 2,408 metres isn’t ridiculously high, some of the activities can go well over 4,000m. You can also buy local remedies for altitude sickness all over town. Coca leaves are helpful for long uphill hikes. Just don’t swallow them. Vaseline or Lip Balm – This one is fairly self-explanatory. You’re in the driest desert in the world. Without it, your lips will crack, bleed and split. I speak from experience. Sun Lotion – The altitude makes you burn a lot faster than if you were at sea level. Map App – While there’s nothing wrong with a good old-fashioned paper map, it won’t help you if you don’t know where you are in the first place. MAPS.ME is a good choice as it allows you to download the maps for offline use (like most apps), but it also shows walking trails and footpaths that are mostly invisible on Google Maps, for instance. Water and Snacks – Again, it’s self-explanatory. You need lots of water in the driest desert on Earth. If you’re stranded, don’t count on rain to save you. Certain areas here receive less than half an inch per year. Some native people have never seen rain in their entire life, particularly closer to Antofagasta. A little snack is helpful, too, as there aren’t any shops outside of the towns. Camera – This is an unforgettable place, but it doesn’t hurt to keep photos.